Should global warming cause sea levels to rise as predicted in coming decades, thousands of archaeological sites in coastal areas around the world will be lost to erosion. With no hope of saving all of these sites, archaeologists Torben Rick from the Smithsonian Institution, Leslie Reeder of Southern Methodist University, and Jon Erlandson of the University of Oregon have issued a call to action for scientists to assess the sites most at risk. Writing in the Journal of Coastal Conservation and using California's Santa Barbara Channel as a case study, the researchers illustrate how quantifiable factors such as historical rates of shoreline change, wave action, coastal slope and shoreline geomorphology can be used to develop a scientifically sound way of measuring the vulnerability of individual archaeological sites. They then propose developing an index of the sites most at risk so informed decisions can be made about how to preserve or salvage them. Urban development, the researchers point out, also is a significant threat to the loss of archaeological data. Coastlines have long been magnets of human settlement and contain a rich array of ancient archaeological sites, many of which have never been excavated. Urban development is projected to remain high in coastal areas, representing a significant danger to undisturbed sites. Thousands of archaeological sites—from large villages and workshops to fragmented shell middens and lithic scatters—are perched on the shorelines and sea cliffs of the Santa Barbara Channel, the researchers point out. The archaeological record is never static, and the materials left behind by one generation are altered by the people and environment of the next. However, increasing threats from modern urban development, sea level rise and global warming are poised to increase this steady pattern of alteration and destruction. 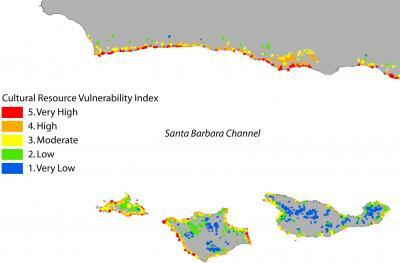 The vulnerability of sites in the Santa Barbara Channel is generally lower than sites located along more open, more gently sloped or unstable coastlines, such as the Atlantic and Gulf coasts of North America. Measuring threats and identifying vulnerable sites is not an end in itself, the researchers say. "We must find ways to act…by quantifying those sites most vulnerable to destruction, we take a first step toward mitigating the loss of archaeological data and the shared cultural patrimony they contain." New University of Florida research puts to rest the mystery of where old carbon was stored during the last glacial period. It turns out it ended up in the icy waters of the Southern Ocean near Antarctica. The findings have implications for modern-day global warming, said Ellen Martin, a UF geological sciences professor and an author of the paper, which is published in the journal Nature Geoscience. Scientists know that during the transition from the last glacial period to the current inter-glacial period about 14,000 years ago, carbon dioxide levels rose very quickly at the same time that the age of the carbon dioxide in the atmosphere fell, as measured by radiocarbon data. That suggests carbon dioxide had been stored in the ocean and suddenly released, she said. One idea holds that it was building up in the Southern Ocean around Antarctica, where extensive sea ice on the surface of the ocean initially prevented the exchange of gasses into the atmosphere, Martin said. The other possibility is that the same process occurred in the Northern Hemisphere with ice sheets in the North Pacific Ocean, she said. In her lab, Martin and lead author Chandranath Basak, a UF graduate student in geological sciences; Keiji Horikawa, a UF postdoctoral fellow in geological sciences; and Thomas Marchitto, a University of Colorado geology professor, studied that question by using a technique to measure isotopes of neodymium, a rare earth element not commonly found in marine sediments but preserved in microscopic fossil fish teeth. The isotopic signature of a water mass, which is captured in the fish teeth, reflects the location where the water mass came from, she said. The researchers took samples that had been shown to have old carbon in them and measured the neodymium isotopes on fish teeth from the sediments to see if they could reconstruct whether they had come from the North Pacific or the Southern Ocean, she said. By giving information about environmental conditions during the last glacial period, the research findings can help scientists to reconstruct what the world was like at that time, she said. The concentration of carbon dioxide in the atmosphere during the glacial periods was about 200 parts per million, compared with 280 parts per million during a typical interglacial period, Martin said. Today that level has soared to about 380 parts per million, she said. The time period that encompasses the last glacial period to the current interglacial period when carbon dioxide levels went up very quickly is often referred to as the “mystery interval” because scientists hadn’t known where the carbon was stored, Martin said. “Now we have a better understanding of how the system worked,” she said.